A MAN WHO promised his on-off girlfriend they would build a house together on a non-existent site before gambling away over €22,000 of her money has been jailed for nine months. 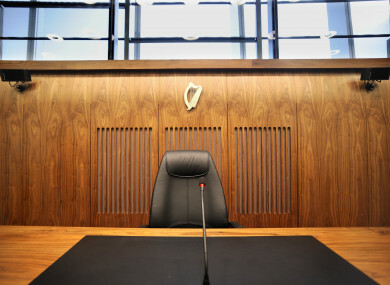 Michael Williams, 45, with an address at Newton Abbot in Devon, England pleaded guilty at Dublin Circuit Criminal Court to falsely misrepresenting lands available for sale at Rathnew, County Wicklow to Eibhlin Butler, on or about 27 February 2008. Judge Martin Nolan sentenced Williams to two-and-a-half years in prison with 21 months suspended, telling him what he had done was “extremely reprehensible”. Judge Nolan said that he would not have suspended any of the sentence but for the fact that Williams’ sister had offered to gift him €10,000 by way of compensation for Butler for the losses she had suffered. “But for the generosity of your sister, you’d be going to prison for a very long time,” Judge Nolan said. The judge said Williams had decided during the course of his relationship with Butler that he would obtain money from her by false pretences. “He convinced her he was going to buy land and she re-mortgaged her property and gave him €22,500. The land was fictional and the agreement to buy it was fictional. He gambled the money,” Judge Nolan said. He said Butler, with good reason, had “lost faith in humanity” and suffered illness and severe financial loss which she was still paying for. “She lost confidence and suffered significant mental distress. She was totally taken in. He meant her to be totally taken in. He deceived her; he was extremely duplicitous,” said Judge Nolan, adding that it was a “huge breach of trust”. Garda Richard Redmond told Tony McGillicuddy BL, prosecuting, that Butler had become acquainted with Williams when they were both involved in the horse industry. The pair were in a casual relationship for two years from April 2007. The court heard Williams suggested to Butler that they would have a child, build a house together on land in Rathnew and run livery stables and kennels. Butler had at the time begun re-mortgaging her own properties as she wanted to clear a number of loans and only have one lump sum repayment a month. Williams told her a man had offered him four acres for sale in Rathnew for €50,000 but had offered to drop the price by €5,000 if they moved quickly. Butler’s re-mortgage came through in February 2008 and she withdrew money and gave Williams €22,000 in cash. When Butler asked Williams where he was getting his share of the money to pay for the site, he said a friend of his, a “dog man” from Kerry, was giving him the cash, and that another friend would “push through” the planning with Wicklow County Council. Butler told gardaí later that after she gave Williams the money, he “went quiet” about the land and said it would be planted with trees for the next few years and not to hassle his friend who was helping them with planning as he was “doing them a huge favour”. Butler asked Williams for a map of where the site was, but he gave her a hand-drawn map which she said she was unable to follow. In January 2010, she texted Williams seeking something in writing to show that she owned two acres of land. He replied that he was not willing to do so and she replied, “Why not Mick? What have you got to hide?” He texted back that he had already told her three times that the land would be in her name. They subsequently met and Butler found out that the land in question had never been sold. Gardaí met with Williams by appointment at Dún Laoghaire Garda Station and asked him if the site in question had ever existed, to which he replied that it had not. He told gardaí he had gambled the money, believing at the time that he would pay it back as he thought he was going to win a fortune by betting. “Looking back now, I would have done anything to get a bet,” he said. In a victim impact report read out on her behalf, Butler said Williams had promised they would have a future together, but that it was “only lies” and he “never had any intention” of them being together. She said she took out a mortgage of €50,000 for home improvements and gave €22,000 to Williams to buy land which she now knew didn’t exist. She said she began to suffer from stress and became extremely unwell with stomach problems at the end of 2010 and during 2011. Butler said she was now only in receipt of a disability pension and still had her mortgage to repay. She said she had been left with serious trust issues and low self-esteem, that she had no confidence and that it had impacted her relationship with her daughter. The court heard Butler had to rely on help from St Vincent de Paul for paying ESB bills, and received food vouchers at Christmas. Vincent Heneghan SC, defending, accepted that his client had committed a “mean-minded crime” and an “absolute breach of trust”. He said Williams was one of seven children whose mother had died in childbirth and that there had been domestic violence in his background. The court heard Williams had a job driving wood chip to various stud farms, through which he got to know stable lads who gave him tips of horses. He started gambling and “thought he was good at it” but became quickly indebted. Williams is now living and working as a delivery man in the UK, where is an involved father to two young children and supports his partner financially, the court was told. He earns about €400 a week and brought what his counsel described as a “paltry sum” of €500 to court. He has no previous convictions. Email “Man promised girlfriend he'd buy non-existent site for house, before gambling away over €22,000”. Feedback on “Man promised girlfriend he'd buy non-existent site for house, before gambling away over €22,000”.